NEW ORLEANS – It’s safe to say that what happened at the Nuttycombe Wisconsin Invitational really changed the NCAA Division I Men’s Cross Country National Coaches’ Poll. Eighteen teams that were ranked in the Week 3 version competed in Madison, Wisconsin, this past weekend and all but one of them had their Week 4 spot affected by their performance over the 8K tract at the Thomas Zimmer Championship Cross Country Course. The team that remained the same in the most recent poll that was released Tuesday by the U.S. Track & Field and Cross Country Coaches Association (USTFCCCA) is the unanimous No. 1 in all of the land, Northern Arizona. The Lumberjacks steamrolled the competition as they scored a minuscule total of 46 points, three fewer than they tallied in a winning effort last year and 32 less than a winning effort in 2016 (They’re three-time champions, you see). What is even more impressive is that NAU did so without the services of Matthew Baxter – one of their top runners. BYU delivered its own dominant performance in South Bend, Indiana, this past weekend. Running at the Joe Piane Notre Dame Invitational, the second-ranked Cougars throttled the field to the tune of 23 points. BYU put its entire top-7 in the top-20 led by five in the top-10 (Connor McMillan earned the individual title in 23:43.7). Wisconsin finished runner-up on its home course and turned that result into a big jump in the National Coaches’ Poll. The Badgers, led by Morgan McDonald’s individual victory, soared six spots from No. 9 to No. 3, their best ranking since they were No. 1 for five weeks in 2012. Boise State showcased its depth in Wisconsin at placed fifth as a team. The Broncos put all of their top-5 runners in the top-50, led by Yusuke Uchikoshi in fifth place. Boise State jumped 19 spots from Week 3 to Week 4 as it comes in ranked seventh this afternoon. That is the highest ranking in program history for the Broncos, topping their previous high-water mark of 14th that they held for one week in 2016. Air Force jetted from No. 17 to No. 10 – its best ranking in the National Coaches’ Poll since it was eighth in 2003 – following its seventh-place effort in Wisconsin. The Falcons flew together as they placed three runners in the top-50, led by Mickey Davey in 18th place. Purdue had never been ranked in the top-30 before in program history. Then again, no other Boilermaker team shocked the nation like the one last week: That’s why they’re now ranked No. 12. Purdue finished ninth in the team standings between perennial powerhouse Colorado and Southern Utah. The Boilermakers had received votes from the electorate just three other times in poll history (Week 4 of 2015, Week 4 of 2017 and Week 5 of 2017). Speaking of receiving votes, three programs went from that category into the top-30 this week: Eastern Kentucky at No. 18, Michigan at No. 20 and Georgetown at No. 29. This is the first time the Colonels have been ranked since 2016. Five teams were dropped from the top-30 between Week 3 and Week 4: Michigan State, Princeton, Villanova, Furman and Texas. 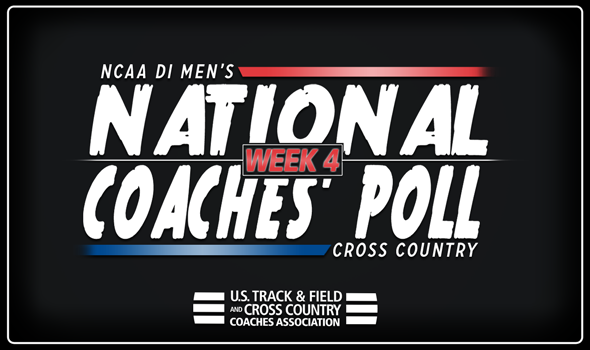 Be sure to check back throughout the season as the National Coaches’ Poll will continue to evolve ahead of the 2018 NCAA Division I Cross Country Championships on Saturday, November 17 in Madison, Wisconsin.